Saturday, Mar. 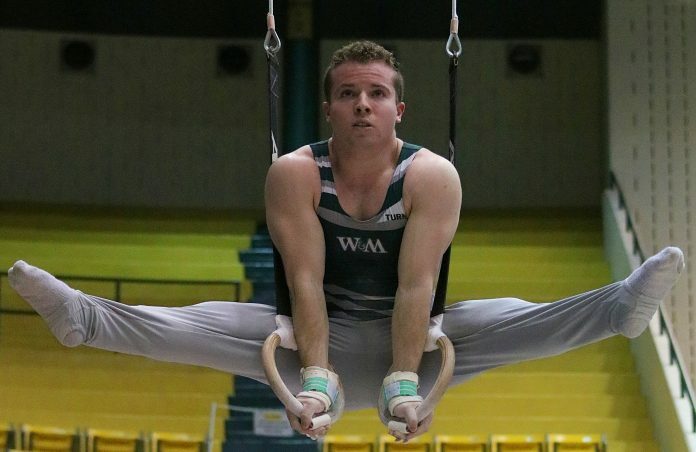 17, William and Mary finished its regular season with a second-place finish in a quad meet at Kaplan Arena, scoring a 391.950 but still losing to Army by 3 points. The score was the Tribe’s third best score of the season and was enough to beat the other two schools competing, Springfield and Temple. William and Mary also earned season-high scores on the floor and high bar. Individually, Tribe athletes won three events, the pommel horse, the rings and the high bar. On the pommel horse, the College swept the podium, with sophomore Spencer Schrandt placing first with a 13.2, followed by senior Jacopo Gliozzi who scored a 13.15 and sophomore Cutter Fugett who earned a 13.0. In the floor event, the Tribe’s success continued, with Fugett scoring a 14.0 to finish in third place. On rings, senior David Watkins and Gliozzi earned the first and third spots overall, scoring a 13.74 and a 13.4 respectively. In the high bar, the Tribe once again took the first and third spots, with senior David Allen scoring a season-best 14.0 and sophomore Ian Creelman achieving a career high score of 13.4. Vault saw one Tribe gymnast place, as senior Jack Hasenkopf scored a 13.95 to secure third place. Freshman Andrew Lyubovsky and Junior Tim O’Neill just barely missed placing in the top three with their scores of 13.85 and 13.8. On the parallel bars, sophomore Ian Creelman didn’t get onto the podium but achieved a career high score of 13.15. Junior Nate Winneg and freshman Kevin Portofee both earned career highs in the all-around competition, scoring 75.65 and a 75.0. The College begins its postseason, competing at the USA Gymnastics Collegiate Championships hosted by Navy on Mar. 29-30.